Description: This mini-project shows you how to construct a manual coil winder jig. It takes around 1 hour to put together when you have all the materials in the list. 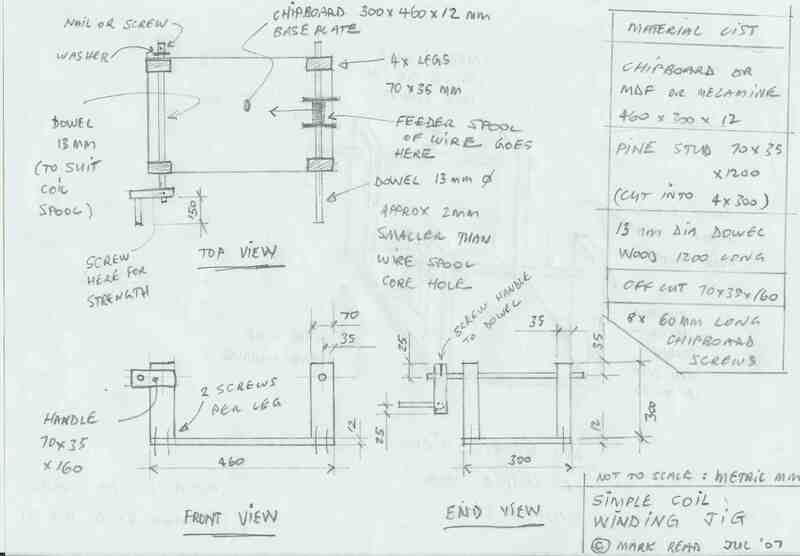 Instructions: View the following materials list, drawings, photos and videos before constructing the jig. 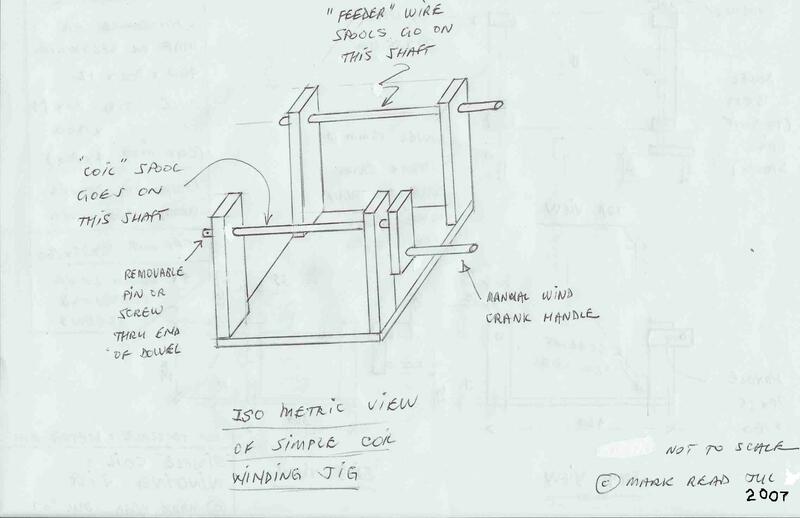 Notes: Refer to the mini-project How To Wind A Bifilar Coil to see the jig in action. The following was purchased from my local Home Hardware depot (similar to Bunnings Warehouse ). Total cost A$0 - A$20 (depending on what you have available yourself). The amounts below is what I paid - or priced - the items at (as of July 2007). qty 1 - 460 mm x 300 mm x 12 mm thick chipboard (or MDF or melamine). A$4.65 (I had an off-cut at home). qty 1 - 13 mm diameter x 1200 mm long wooden dowel. A$4.60 (I selected 13 mm because it was small enough to fit inside my wire spools with a little play, and thick enough not to break easily). qty 1 - 70 mm x 35 mm x 160 mm. A$0 (the hardware store had this off-cut in their rubbish bin). Dollop of PVA glue (for crank handle). A$3.20 for a small bottle. 2 mm wood drill bit (for drilling our pilot holes). 13 mm wood drill bit or spade bit (make it the same size as the dowel diameter you've selected). Philips head bit (for the screws). G Clamp (with a minimum 80 mm gap in the fully opened position). View the construction drawings here. View the construction videos, either streamed (in a new web browser window that opens automatically when you click on the link) via the YouTube website, or via downloading the Microsoft wmv files to your computer. Simply click on each video link below to watch in a new window (if you're on a Microsoft Windows platform, like Windows XP), or right click on a link and select 'Save Target as ...' to download the video to your computer & watch off-line. Ensure you've got all the materials and equipment you need (refer to the lists above) before starting. View all the drawings, photos and videos (above) to get an idea of what you're about to build. Print off any drawings and photos to help the construction process. Set aside 1 to 2 hours to complete the build. Start by cutting your base plate to the size required. I've cut mine to 460 mm x 300 mm from a left-over piece of 12 mm chipboard (roughly 1 1/2 foot x 1 foot x 1/2 inch thick). I figured 300 mm wide was wide enough to fit 3 x 75 mm long (3 inch) spools side-by-side (ie. for a trifilar wind). If the wire spools you plan on using are longer then buy/cut yourself a wider base plate (and adjust my drawings accordingly). Cut the 1200 mm soft pine "stud" into 4 equal lengths of 300 mm each, giving you 4 "legs". Cut the dowel rod into 1 x 180 mm and 2 x 510 mm lengths. Take 2 legs, stand them up vertically side-by-side (as per the video), clamp them together so they don't move during drilling, and drill a 13 mm hole with the spade bit, 35 mm down from the top and 35 mm in from the edge of the 70 mm width. These legs will form our "spool feeder" row. Slide one of the 510 mm long dowel rods through both holes - if the dowel is a little "too snug" (a little too tight to slide in and out of the holes easily), use the spade bit to over-size the hole by 1mm. You want the dowel to slide in and out of the 2 holes easily. Do the same with the other 2 legs. These 2 legs will form our "spool winding" row. Take the 70 x 35 x 160 mm off-cut and drill 2 holes in it; one from the top 25 mm down and 35 mm in (1/2 of the 70 mm width), and the other an exact opposite from the other end. This forms part of the crank handle. Put some PVA (wood) glue on the end of the shortest (180 mm long) dowel piece and insert into one of the holes in the crank handle. Put it aside to let it dry. Take one of the legs and place it on the base plate in one corner so that 2 of the 4 sides are flush with the edge of the base plate (see diagrams and video). Trace an outline with your pencil. Repeat for all other (3) corners. Each corner of the base plate will now have a 70 mm x 35 mm rectangle, whereby 2 of the sides are the edges of the base plate. Now drill 2 x 2 mm pilot holes through the base plate where each of the legs are to go (the rectangles drawn in step 8 above). This is to make it easier to drill the legs to the base plate. The holes should be 18 mm in from the edge of the base plate and equally spaced along the 70 mm length. Stand the 4 legs up on their ends, with the dowel closest to the workbench. Place the base plate on top of the 4 legs. Position each leg, one at a time, into it's respective corner and fix each leg to the base plate with the 60 mm long chipboard screws. Turn the base plate up-side-down so the legs are now sticking up in the air. Slide the crank handle onto the "winding" row dowel. Apply PVA glue (for extra strength, drill a small 2 mm pilot hole through the top of the crank handle and through the centre of the dowel, then screw in a 40 mm long screw). Trim any access dowel you don't want. On the other end of the "winding" row dowel (opposite end to the crank handle), drill a small 2 mm hole and screw in a small 20mm to 30 mm screw. This is to stop the winding dowel sliding out of the hole during manual winding. Simply unscrew this retaining screw and slide out the winding dowel whenever you need to add or remove a coil spool. Add a 75mm high pine strip (or such) as a "skirt" all the way around the base so the base effectively becomes an open storage box. Now you can put your spare coil spools and other bits & pieces for coil winding on the base plate for safe keeping. If you were to pickup the jig and carry it elsewhere, all your "bits" won't slide off the base plate and onto the floor. View these photos to see what I mean by the wrap-around pine "skirt". The 75 x 19 x 1800 mm pine timber cost me A$3.14 - and the guy at the timber yard used his drop-saw to quickly cut it up into 2 x 300 mm lengths and 2 x 498 mm lengths.